FlexEnergy, headquartered in Portsmouth, New Hampshire, faced exactly these issues. As builders of robust small gas turbine products, they utilize an internal Ethernet network to interconnect a PLC, a HMI, an imbedded PC, and a power inverter inside their GT333 Combined Heat and Power (CHP) unit. By incorporating a Skorpion Router into each GT333, they are able to meet all the goals above. The EIPR links two 10/100Mbps Internet Protocol networks, passing appropriate traffic while blocking all other. The EIGR provides the same functions at Gigabit speed. Both units feature a 4-port Local Area Network (LAN) and a single-port Wide Area Network (WAN). A built-in firewall prevents unauthorized access to the LAN side devices from the WAN side, but the routers provide features such as Port Forwarding and Network Address Translation (NAT) that allow for WAN to LAN access. The WAN port can be configured for a static IP address or can be assigned a dynamic address via the built-in DHCP client to quickly integrate to the customer's network. The IP router also keeps multicast and broadcast traffic separated between the LAN and WAN, keeping the IP devices running smoothly without having to deal with unnecessary traffic filtering. Additionally, by using the EIGR-V / EIPR-V models, remote access to the machine network from the internet via Virtual Private Networking (VPN) technology is possible. "The IP ports from the external WAN IP address were mapped to different internal LAN devices in the control panel. This setup was then easily uploaded to multiple routers for use in different turbines, allowing for the same configuration to be used across all devices to speed up testing and installation.," said Harpartap Parmar, Contemporary Controls Senior Product Manager. 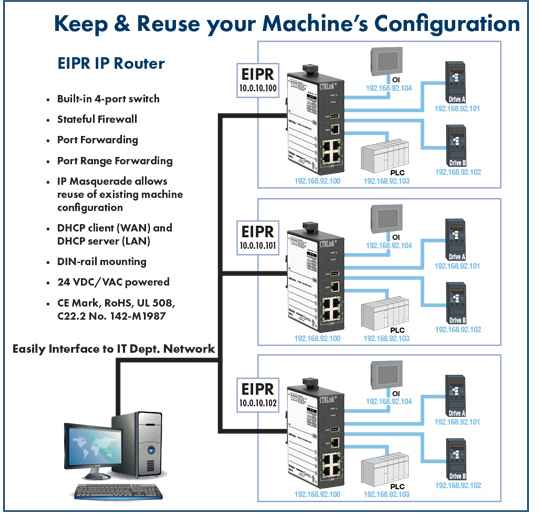 Visit the IP Router page to learn more.